Long before there were power tools, carpenters and woodworkers used hand planers to smooth out their wood. Now if you were to Google hand planers, you would see a lot of hand planer reviews that might discourage you from using one. However, the truth is that hand planers are still an important tool to keep in your toolbox. There are many different types of planers on the market, so we do our best to break it down for you so you can find the best planer for the job. Inexpensive – You may be able to save money by shopping for a hand planer at a flea market or a garage sale. Many people think that the hand planers are too old to use, but this is not the case and why spend a huge amount of money when you might be able to find an older one? Buying one might cut costs and sometimes there’s a job that requires the use of a hand planer. Shaving Wood – Not even an electric planer can shave wood the way that a hand planer can, this is why carpenters and other woodworking professionals still use hand planers. For the finest smoothing action no electric planer is useful since they have a minimum thickness that they can plane. Longer battery life with a splendid overall performance, the Bosch PLH181K is your perfect choice for a a dependable yet inexpensive hand planer for those final finishing touches that any woodwork always seems to need. It features smoother cutting, faster operations with an ideal cutting angle setup, edge guide fence, is battery operated with a Li-Ion battery pack, the BAT618 that requires only 30 minutes for a full charge. The Bosch 1594K is not your typical hand held planer. 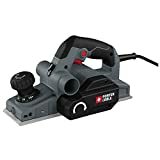 It differs in the power and design with a decent 6.5 Amp motor operating at 16,500 RPM with a simple to adjust bevel face and rest stand that is spring loaded to interact with precision based on the wood surface you are using it with. It comes with a chip bag, case, bevel guide fence and a long one year warranty. 3.25 inch hand planer design that incorporates lightweight components and a powerful 7.5AMP motor that rotates at 16,000 RPM for the closest and deepest leveling. The Makita KP0810 can manage up to 5/32 inch deep and 3-14 inch wide cuts in a single pass. Designed to be ergonomic, this hand planer comes with depth adjustment on the handle and a rubberized grip with a front base that together with the rest of the body is made from aluminum housing. Designed for a precise cut, the Makita 1002BA is blessed with a 4-3/8 inch curved edge that can be easily controlled with two hands for good control. It features a fine depth adjustment and larger front grips with an ejection chute to the back and adjustable bevel radius of 11 to 13 inches. This is an excellent addition for any Log Home builder or Timeber Framber. 7 Amp motor with a heavy duty construction housed in a lightweight but sturdy outer body, the DEWALT DW680K is your traditional hand planer with a maximum cut depth of 2.5 millimeters in a single pass. It uses a Calibrated depth adjustment knob to precisely set the depth and removes the need to regularly zero your depth and waste wood. It uses carbide blades that are highly detailed, precise and tougher in construction. Why Not Use an Electric Hand Planer? Once there were planers of all kinds with different angles and for different uses. Now jointers, routers, sanders etc have all decommissioned their use. Nevertheless, having a basic hand planer in your arsenal is critical even today. 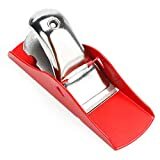 These tiny things are helpful even today for those who are really into finishing off craft and hobby works with finesse and the utmost quality. Carpenters use it to get the thinnest shave possible, to smoothen out edges and remove that one or two wood strands sticking out. Yes, progress has made a lot of things obsolete these days, but nothing can really replace the way a hand planer can shave wood. 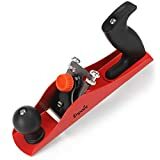 Just remember before you spend a lot of money buying a new hand planer, you really should read our reviews and check amazon.com to see if you can pick up a hand planer for a reasonable price. And if you can’t find one in your limited budget then check in flea markets for second hand or passed down hand planers. These tiny instruments never go bad and a little maintenance can revive an otherwise outdated and blunt instrument. 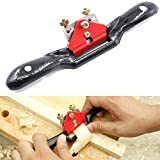 There are a lot of different hand planers out there so we have written some unbiased hand planer reviews on some of the best planers on the market. We hope that after reading our reviews, you are able to make the right decision when buying an electric hand planer.